Today, April 2nd, is my sister Kim's birthday. This is the card I gave her and she really liked it so I thought I would share it with you! Bashful Blue, Barely Banana, Close to Cocoa, and Pale Plum. Create standard card in Barely Banana. Cut 4 x 5-1/4 Close to Cocoa and use the Big Shot with the Polka Dotted Textured Impressions Folder. Use the Corner Rounder Punch on two opposite sides, and the new Scallop Trim Corner punch on the other two. Wrap Chocolate Chip Ribbon around the front of the card, adhere in the back. 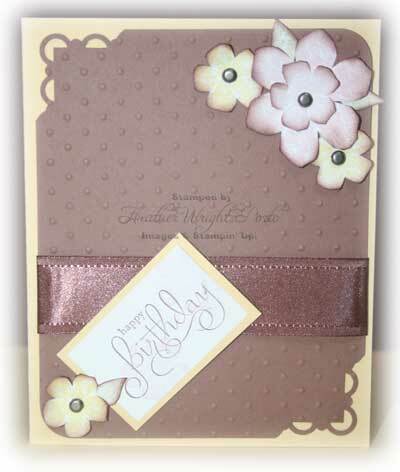 Stamp greeting in Chocolate Chip and mat on Barely Banana paper. Stamp and cut out 3 small flowers from the Vintage Vogue stamp set with Barely Banana ink. Stamp and cut out 1 small flower and 1 large flower in Pale Plum using the Vintage Vogue stamp set. Stamp and color a few leaves in Mellow Moss. Using a sponge Dauber, rub in Chocolate Chip ink and dab along the edges (like the sponging technique). Pierce all the flowers and place Vintage Brads through them. Adhere to flowers to the Close to Cocoa paper using Stampin' Dimensionals or by punching though the Close to Cocoa cardstock. Adhere greeting with Stampin' Dimensionals on a slant. Adhere Close to Cocoa panel using SNAIL Adhesive.